When Graham Gano’s record-tying 63-yard bomb went through the uprights late Sunday afternoon and gave the Panthers a 33-31 win over the New York Giants, it took the edge off what was nearly a disastrous loss. Despite outplaying the Giants for most of the game, the Panthers found themselves in that old familiar position–holding on for dear life in a game that they had once controlled. Of course, this is the NFL, and wins are almost never easy. But Sunday’s game was different from many of the past games that followed this script. The Panthers were truly lucky, and won in spite of themselves. Coming into the game, the biggest storyline was the Odell Beckham interview that aired on ESPN Sunday morning. ESPNs Josina Anderson did a fantastic job in this interview, and her rapport with NFL players is really interesting to watch. I didn’t feel like OBJ was completely comfortable saying the things he said about his teammates and about being happy in New York. Anderson definitely put him on the spot for an answer, and coaxed out a really big story. She was doing her job and I don’t fault her one bit. But I got the vibe that OBJ felt pressured to say something provocative because of the bizarre presence of Lil’ Wayne. What ended up happening was OBJ came off as passive-aggressive and it was not a good look. Either way, the Giants looked determined to get OBJ the ball on Sunday, which is what they should be doing, and it worked. Beckham and Saquon Barkley is the most lethal combinations the Panthers have faced this year, and it was clear that they were very concerned about stopping them. The defensive line disrupted that Giants’ running game all day, holding Barkley to 48 yards on 15 carries. Looking deeper, Barkley had carries of 30 and 20yards, the former being an amazing individual effort by Barkley to spin free of Wes Horton in the backfield and accelerate through a completely different gap than the one for which the play was designed (it was the gap vacated by Horton, who had blown up the play in the backfield). The latter of those long runs was a busted contain by rookie Rashaan Gaulden. Aside from those two plays, Barkley carried 13 times for minus-two yards. Ron Rivera promised to fix the run defense, and he certainly delivered on that promise. Beckham showed why he is one of the game’s best receivers, working the Panthers for 131 yards receiving and a beautiful TD catch in the fourth (the throw by Eli Manning was also beautiful). James Bradberry did a good job on Beckham, but when the Panthers went into zone looks, Beckham was able to find space. The Giants made really nice use of play action once it became clear that Carolina was focused on stopping the run, and used the Panthers’ aggression against them on the double pass from OBJ to Barkley. OBJ is incredibly dangerous in the open field, and it’s not a surprise that the Panthers were selling out to get to the football right there. You have to just tip your cap to Shurmur and Shula for calling the play, and Beckham for making a tough throw. All the Giants’ TDs were either Barkley or Beckham, and when you’re facing a team with these types of weapons, they’re liable to put some points on you. The Panthers’ defense really wasn’t terrible, and outside of Donte Jackson letting Russell Shepard of all people run right by him (I don’t think I can emphasize enough how bad that was), they held up pretty well. I saw a few Twitter posts about the Panthers’ lack of pass rush yesterday, citing only one sack of Eli Manning, so I took another look at the game to see if indeed the pass rush was as bad as the numbers said it was. While it is true that the Panthers did not sack Eli Manning or knock him down often, there were plenty of times when the Panthers pressured Manning, particularly in the first half. 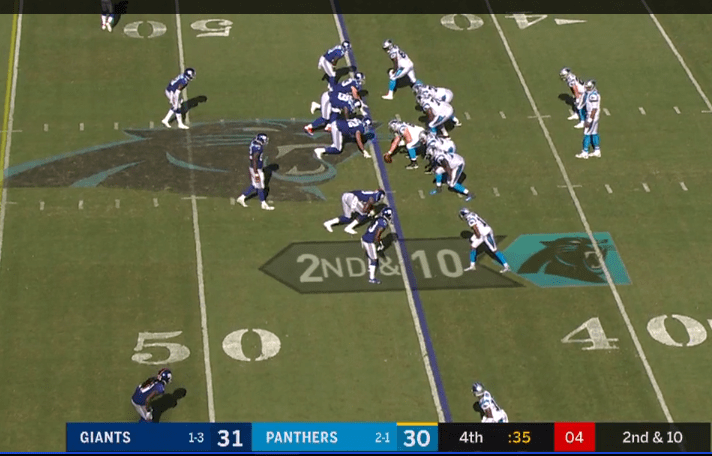 Luke Kuechly got home on an A-gap blitz on a Giants fourth-down try from inside Carolina territory and although he did not get the sack, he clearly forced Eli to make a back foot throw before he was ready. Just before the half with the Giants moving the ball near midfield, Kawann Short collapsed the pocket immediately after the snap and forced Eli to make a bad throw well short of the first down line-to-gain, and the Panthers were able to keep their 20-13 lead. The Giants went to more quick passes in the second half and Eli did a good job of feeling the rush and moving around in the pocket for most of the day. The Panthers pass rush will be just fine, especially if Efe Obada continues to improve. Speaking of continuing to improve, DJ Moore and Curtis Samuel were the big playmakers in the passing game. It feels inevitable that Norv Turner will give the bulk of the snaps to these guys by the end of the season. They both ran hard after the catch yesterday, and played with an attitude. I think Panthers Twitter has beaten this horse to death by now, and it seems to be trending in the right direction with Moore getting 29 snaps and Samuel 12 in his first game back from injury/illness. If the Panthers can keep these guys healthy and get Greg Olsen back on the field, the offense could be very, very good later in the year when the schedule gets tougher. That tough late-season run that includes the Saints twice in three weeks makes this win not just important, but critical. The Giants came into this game at 1-3, with obvious internal issues, and if the Panthers had lost this one (at home no less), it would have been inexcusable. Although the Panthers controlled this one in the fourth quarter, they very nearly let it get away, and probably got luckier than Panther fans would like to admit. First of all, the Panthers’ luck with fumbles was through the roof. The special teams should get credit for playing hard through the whistle, but the punt return fumble that hit Beckham, caromed off a Giant’s foot, and ultimately ended up as Colin Jones’ first career TD was just pure good luck. If that ball took a different bounce anywhere in that sequence, the Giants easily could have recovered it, it could have gone out-of-bounds, or it could have just harmlessly bounced into the end zone before it hit OBJ. 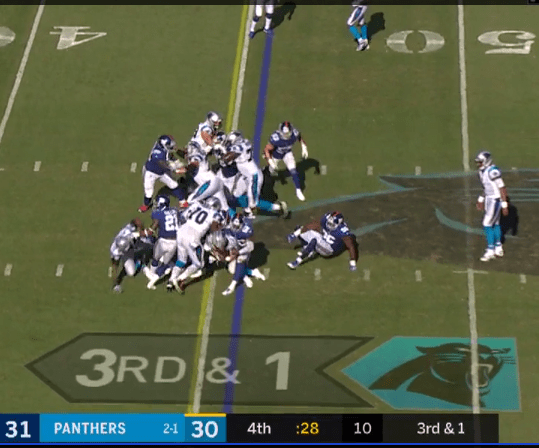 Later on, Cam made a really nice run to gain a first down, failed to secure the football on the hit by Eli Apple, and fumbled it right to about three Giant defenders, but by pure luck, Curtis Riley’s toe was out of bounds when he recovered the ball for New York. The Panthers ended up getting a field goal later in that drive, and when you win by two, that’s a pretty important break. The Panthers also benefitted from a couple of calls that, at best, could have gone either way. The first was the 3rd-and-13 play early in the fourth quarter, where a questionable helmet-to-helmet call negated an incomplete pass to Devin Funchess. Although there was contact to the helmet and Funchess looked shaken up, it seemed to me like both defenders were going for the ball and the contact was incidental to the play, not an attempt to make a hit. The resulting first down kept alive the drive that produced the CMC touchdown catch that made the score 27-16. Then, on the game’s final drive, McCaffrey was very close to a first down, and it was difficult to tell if he had made it, but the officials awarded the first down without a measurement or review, allowing the Panthers to clock the ball and ultimately give Gano a chance to set up for the game-winning kick. There is a lot to unpack from this sequence, so I’ll start with the officiating. The Panthers were out of timeouts, and so were the Giants, so the officials understandably probably wanted to remove themselves from the outcome by spotting the ball quickly and decisively. A measurement would have amounted to a free timeout for Carolina, and at that point it looked like they had run themselves out of time by going above and beyond their usually poor end-of-half/game clock management. So I applaud the officials for what I perceived as their attempt to let nature run its course. A LOT of Giants fans on Twitter were extremely upset about this sequence, and given the outcome, I understand that frustration. I looked back at the play in slow-motion about ten times before I realized that Fox had the “unofficial yellow line” graphic displayed about a half-yard long of where the real line-to-gain should have been (see below). Note the nose of the football in the first picture is a foot or so short of the Carolina 45, meaning the line-to-gain would have been a foot or so short of the NY 45. Fox had the graphic displayed on the wrong side of the NY 45, and that made it look like the play was much closer than it was. The second picture shows McCaffrey holding the ball in his right arm, clearly across the NY 45. So I think the officials got this one right, although I’m sure less than 0.00001% of Giants fans would entertain my argument. I understand completely. What this controversy and the Gano rocket masked somewhat is that the call to run CMC on third-and-one was highly questionable. In retrospect, I think I see what Riverboat and Norv were doing, but it makes me cringe. Gano’s previous career long was 59 yards, and his kick Sunday would have been good from near 70. So he obviously has the leg to justify trying from that range. I’m guessing that Ron didn’t want to risk an outside run that might lose a couple of yards since they were at the edge of sanity with respect to trying a field goal there. He also wanted the first down so they could clock the ball on the next play, and he felt like he could rely on the offensive line and CMC to get him two or three yards to make the try more in line with Gano’s previous career long. Here is why that logic is terrible. If CMC fails to get the first down, you have no choice but to run the field goal unit out there and set up for a hasty try as time winds down. That seems like it would diminish the already fairly low chance of making a 63-yarder under pressure. Also, remember that Ryan Kalil had left the game due to an injury a few plays before, and the Panthers had their backup center, Tyler Larsen in the game. Larsen is a decent backup, but the Giants interior defensive line had given the Panthers fits for most of the second half, so running up the middle had a lower than normal chance of success there. If the Panthers were worried about being able to stop the clock, it seems like a short pass over the middle would do the same thing as they were trying to do with the run up the middle, but with an extra chance at a positive result if the pass failed in that the clock stops. If the pass is complete, you run up and clock the ball and trot out the field goal unit. What ended up happening is the Panthers got extremely lucky that the officials were decisive in their actions to spot the ball, and Gano hit a FG that we will all remember for a very long time, but probably goes in less than half the time. Riverboat Ron comes out a winner, but like the guy who outdraws you in poker game, over time, his strategy is poor. This has been a problem for the Panthers for some time, and I heard recently that Sean McVay hired a guy whose job it is to help him manage the clock in the endgame. Maybe it’s something Riverboat ought to consider. Moving on to next week, the Panthers face a tough test in Washington. I’ll take a better look at that matchup later in the week after I get a chance to look at Washington a little better. For now, let’s enjoy this win, and hope the breaks continue to go our way. Which Team Is The Most Valued NFL Franchise? Although I was born and raised in North Carolina, I have lived all over the world thanks to the US Air Force. My current home is in Glendale, Arizona, not far from University of Phoenix stadium. I am married with two girls, and in real life I fly F-16s. Where I come from, we pull for the Panthers no matter what, and I've got the Jimmy Clausen tattoo to prove it--okay i made that part up, but I do follow the Panthers about as closely as anyone. I hope to bring my passion for NFL football and the Carolina Panthers to my writing, so that readers will learn, engage, and ultimately enjoy the game and the team more. I also write fantasy football columns at http:''hardknockfantasy.com, and you can follow me on Twitter @Grizz15E and @HardKnock_FF.